Free Pick Up Locations Across the US! Solid and Engineered Shaw Hardwood Flooring! Shaw hardwood floors is a clear leader in the hardwood flooring industry. With several exciting new products coming out to add to their already fabulous hardwood flooring line you’ll surely be impressed. If you’re looking for a solid or engineered product Shaw’s product line has it all to offer. They have solid oaks, maples, hickory, and tons of exotic species that will look good in any decor. If you’re looking for a hand scraped floor then you can get it in a solid like the Grand Canyon which is an 8″ wide in 72″ lengths, or engineered like the Pebble Hill Hickory and comes in most domestic species. Shaw creates great floors for the places where we live, work, learn, and gather. Most importantly, Shaw creates great flooring for the places we call home. That’s a privilege we take seriously. If you are looking for a Shaw product with a good price call (844) 498-7444 or email daltonsales@truehardwoods.com for a price quote on the Shaw hardwood floor of your choice or we’ll help you decide on a floor that fits your lifestyle and decorating taste. Shaw has just introduced a few new lines that are bringing a lot of attention. The Castlewood Oak and Castlewood Hickory series are bringing the wire-burshed, low gloss finish back into action, as well as the style of a 7 1/2″ wide plank. The product line features some grey tones that have become more desirable. The Sequoia Hickory is an offshoot of the Pebble Hill Hickory but with some bonus options, and a more ecnomical price. It is a heavy handscraped that comes in either a 5″ width, a 6 3/8″ width, or a mixed-width combination of 3 1/4″, 5″, and 6 3/8″. Shaw the innovative leader in flooring just keeps turning out new and beautiful products. 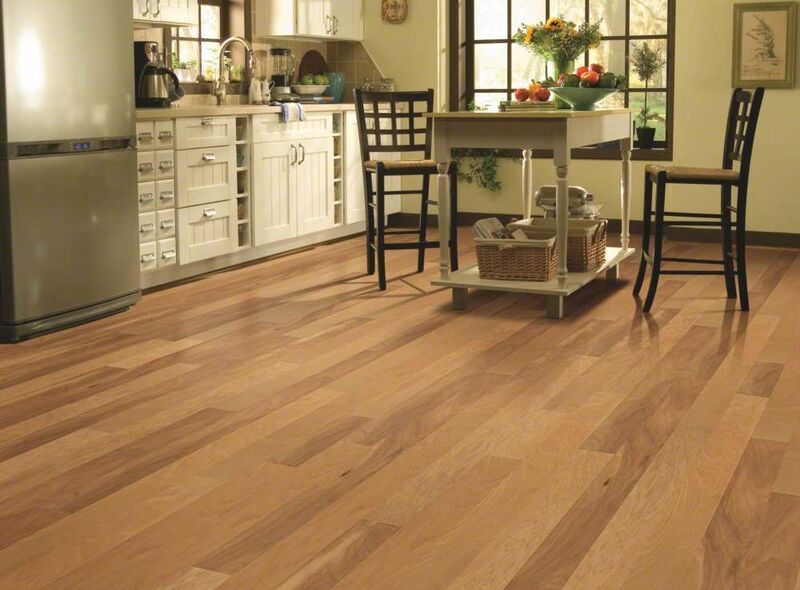 You can’t go wrong when you purchase a Shaw hardwood Flooring product. The new Addison Maple originated from the aged and distressed hardwood we see in vintage floors. The rich undertone creates harmony and balance between the natural movement of rustic maple wood grain and the subtleties of authentic age and character. This timeless visual tapestry will compliment any interior design style. Join us on a journey through antique America with the vintage styling of the Shaw American Restoration Line. This collection of classic, colonial-style wood flooring planks comes in the old world tradition of an oil-stained look but with the resilience and low-maintenance advantage of having the most advanced finish in the industry. With the ScuffResist Platinum, aluminum-oxide reinforced urethane, multi-layer coating system, this wood flooring may have the look of an old, worn and tattered barn but it is in fact more resistant than most wood floors to abrasions, scuffs and scratches. Almost six and a half inches in width, the extra wide planks give the American Restoration collection by Shaw Hardwoods an expensive, high-end look but comes at a very reasonable price. The Epic Landscapes earth-conserving HDF core allows Shaw to reduce the overall cost of manufacturing which drives the cost down to an affordable rate. Not only is the Shaw American Restoration collection a very affordable selection for your next project, True Hardwoods price is actually lower than the manufacturer will allow us to advertise! Shaw Golden Opp 2 1/4"
Shaw Hardwood Fairbanks Maple 5"